New entrepreneurs frequently ask me for advice about forecasting their sales. These entrepreneurs are always optimistic about the future of their new company, but when it comes to talking about the details, most aren’t sure how to predict future sales and how much money they’re going to make. So, my advice is always to just take a big breath and relax. You’re as well equipped as everyone else to put together a credible, reasonably accurate forecast. Let’s dive right in and figure it out. Your sales forecast is the foundation of the financial story that you are creating for your business. 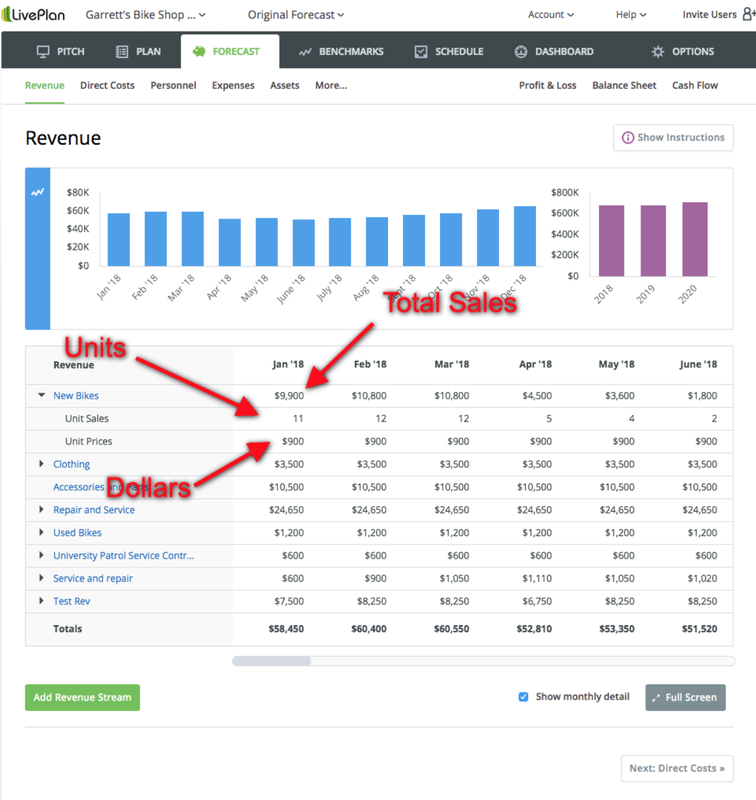 Once you have your sales forecast complete, you’ll be able to easily create your profit and loss statement, cash flow, and balance sheet. But beyond just setting the stage for a complete financial forecast, your sales forecast is really all about setting goals for your company. What do you hope to achieve? How many customers do you hope to have next month and next year? How much will each customer hopefully spend with your company? Your sales forecast will help you answer all of these questions. Your sales forecast is also your guide to how much you should be spending. 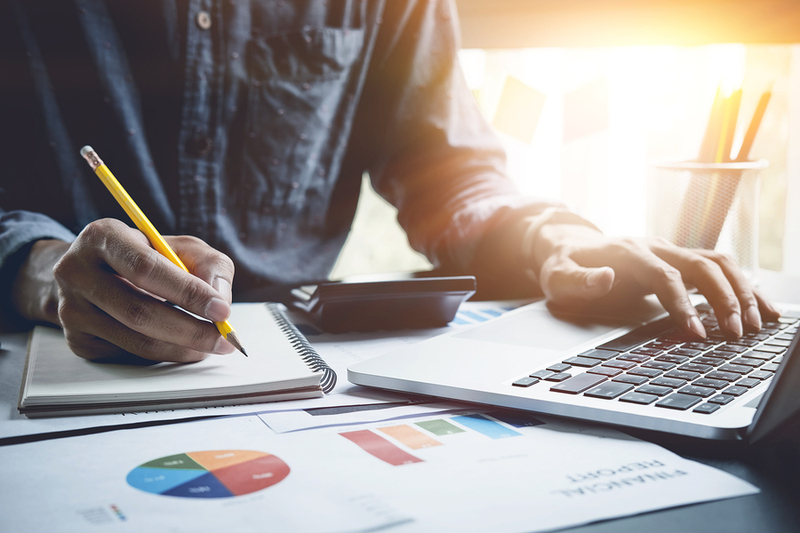 Assuming you want to run a profitable business, you’ll use your sales forecast to guide what you should be spending on marketing to acquire new customers and how much you should be spending on operations and administration. Now, you don’t always need to be profitable, especially if you are trying to expand aggressively. But, you’ll eventually need your expenses to be less than your sales in order to turn a profit. How detailed should I be? When you’re forecasting your sales, the first thing you should do is figure out what you should create a forecast for. You don’t want want to be too generic and just forecast sales for your entire company. On the other hand, you don’t want to create a forecast for every individual product or service that you sell. For example, if you’re starting a restaurant, you don’t want to create forecasts for each item on the menu. Instead, you should focus on broader categories like lunch, dinner, and drinks. If you’re starting a clothing shop, forecast the key categories of clothing that you sell, like outerwear, casual wear, and so on. You’ll probably want to end up with three to 10 categories for the types of sales that you do. More than 10 is going to be a lot of work to forecast and fewer than three probably means that you haven’t divided things up quite enough. You really can’t get this wrong. After all, it’s just forecasting and you can always come back and adjust your categories later. Just pick a few to get started and move on. Top-down or bottom-up? Which is better? Before they have much historical sales data, lots of startups make this mistake—and it’s a big one. They forecast “from the top down.” What that means is that they figure out the total size of the market (TAM, or total addressable market) and then decide that they will capture a small percentage of that total market. For example, in 2015, more than 1.4 billion smartphones were sold worldwide. It’s pretty tempting for a startup to say that they’re going to get 1 percent of that total market. After all, 1 percent is such a tiny little number, it’s got to be believable, right? The problem is that this kind of guessing is not based on any kind of reality. Sure, it looks like it might be credible on the surface, but you have to dig deeper. What’s driving those sales? How are people finding out about this new smartphone company? Of the people that find out about the new company, how many are going to buy? So, instead of forecasting “from the top down,” do a “bottom-up” forecast. Just like the name suggests, bottom-up forecasting is more of an educated guess, starting at the bottom and working up to a forecast. Start by thinking about how many potential customers you might be able to make contact with; this could be through advertising, sales calls, or other marketing methods. This is your SOM (your “share of the market”), the subset of your 1 percent of the market that you will realistically reach—particularly in the first few years of your business. This is your target market. Of the people you can reach, how many do you think you’ll be able to bring in the door or get onto your website? And finally, of the people that come in the door, get on the phone, or visit your site, how many will buy? Obviously, these are all nice round numbers, but it should give you an idea of how bottom-up forecasting works. The last step of the bottom-up forecasting method is to think about the average amount that each of those 100 people in our example ends up spending. On average, do they spend $20? $100? It’s O.K. to guess here, and the best way to refine your guess is to go out and talk to your potential customers and interview them. You’ll be surprised how accurate a number you can get with a few simple interviews. Units or dollars? Which is better? Let’s start by talking about “unit” sales. A “unit” is simply a stand-in for whatever it is that you are selling. A lunch at a restaurant would be a unit. An hour of consulting work is also a unit. The word “unit” is just a generic way to talk about whatever it is that you are selling. Now that’s out of the way, let’s talk about why you should forecast by units. Units help you think about the number of products, hours, meals, and so on that you are selling. It’s easier to think about sales this way rather than to think just in dollars (or yen, or pounds, or rand, etc.). With a dollar-based forecast, you are only thinking about the total amount of money that you’ll make in a given month, rather than the details of the number of units that you are selling and the average price you are selling each unit for. To forecast by units, you predict how many units you’re going to sell each month—using the bottom-up method of course. Then, you figure out what the average price is going to be for each unit. Multiply those two numbers together and you have the total sales you plan on making each month. For example, if you plan on selling 1,000 units at $20 each, you’ll make $20,000. When you forecast by units, you have a couple of different variables to play with: What if I’m able to sell more units? What if I raise or lower my prices? Also, there’s another benefit: At the end of a month of sales, I can look back at my forecast and see how I did compared to the forecast in greater detail. Did I meet my goals because I sold more units? Or did I sell for a higher price than I thought I would? This level of detail helps you guide your business and grow it moving forward. How far into the future should I forecast? I recommend that you forecast monthly for 12 months into the future and then just annually for another three to five years. The further your forecast into the future, the less you’re going to know and the less benefit it’s going to have for you. After all, the world is going to change, your business is going to change, and you’ll be updating your forecast to reflect those changes. 12 months from now is far enough into the future to guess. And don’t forget, all forecasts are wrong—and that’s O.K. Your forecast is just your best guess at what’s going to happen. As you learn more about your business and your customers, you can change and adjust your forecast. It’s not set in stone. My final word of advice is to make sure that you graph your monthly sales with a chart. A chart will make it easy to see how your sales might dip during a slow period of the year and then grow again during your peak season. A chart will also highlight potentially unreasonable guesses at your sales growth. If for example, you show a big jump in sales from one month to the next, you should be able to back this up with a strategy that’s going to deliver those sales. Your sales forecast isn’t done when you start sharing it with lenders and investors, though. Smart businesses use their sales forecast to measure their progress and ensure that they’re on the right track. Their sales forecast becomes a management tool that helps them run their business better. The easiest way to convert your sales forecast into a management tool is to have a monthly financial review meeting where you look at your business’s finances. You shouldn’t just look at your accounting system, though. You should compare the numbers from your accounting software to your forecast and see if you’re on track. Are you exceeding your goals? Or maybe you’re falling a little bit short. Either way, knowing if you’re meeting your goals or not will help you determine if you need to make some shifts in strategy. This way, your business numbers drive your strategy. Tools like LivePlan can help with this. 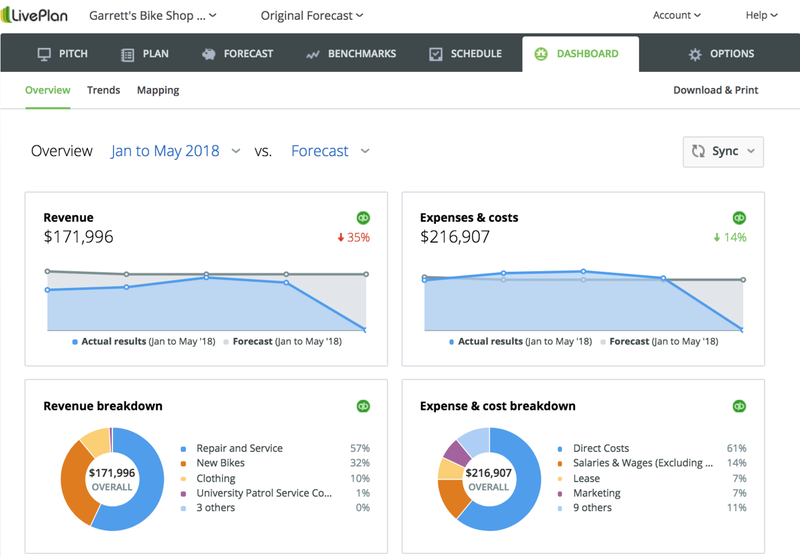 LivePlan uses a smart dashboard to automatically compare your forecast to your numbers from your accounting system—no cutting and pasting or complicated spreadsheets required. This Youtube video walks you through how to set up a strategic forecast in LivePlan. Plus, it’s easy to print or create PDF financial reports with the right level of detail to share with your team. Just remember that sales forecasting doesn’t have to be hard. Anyone can do it and you, as an entrepreneur, are the most qualified to do it for your business. You know your customers and you know your market, so you can forecast your sales. Editor’s note: This article was originally published in March 2016, and was updated in June 2018.